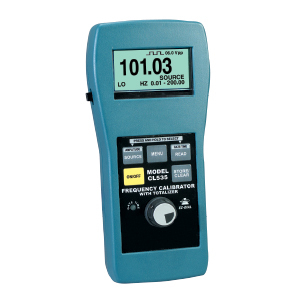 The Omega CL535 is an excellent tool for calibration, test, and diagnostics of instruments that use frequency signals. Instruments include tachometers, frequency counters, integrators, and any other frequency devices in the shop, plant and/or field. The CL535 brings all the features you would expect from a frequency calibrator and timesaving new ones with the easy dial knob and easy check switch saving hours of troubleshooting time. The CL535 comes with an LED indicator showing gate time for easy trigger level adjustment. When calibrating a totalizer, the CL535 eliminates the need of a stop watch. The calibrator will automatically stop when the selected number of pulses has been sent to the totalizer. 참고: Comes complete with NIST traceable certificate, battery and operator’s manual.